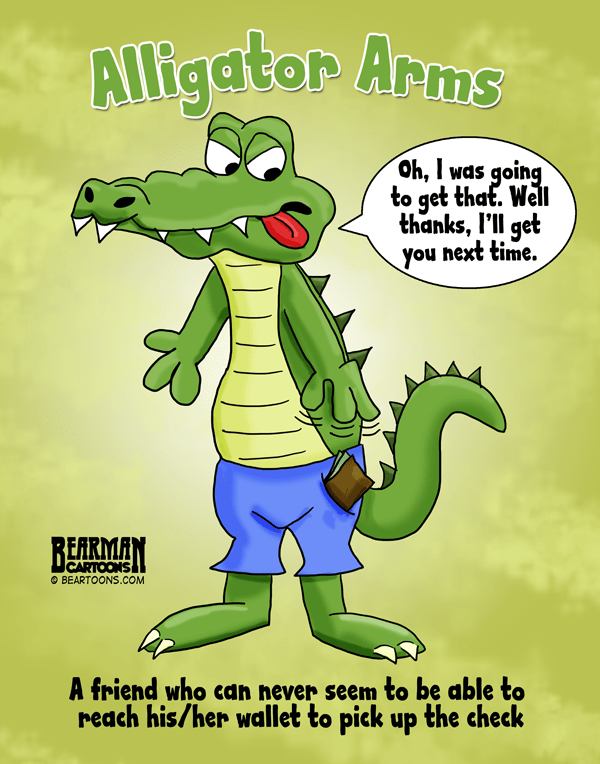 Alligator Arms Cartoon definition by Bearman Cartoons. The phrase “Alligator Arms” (or Dinosaur Arms) is one my friends and I have used for years to describe our other cheap friends. Seems Urban Dictionary has the same idea. Everyone know this person. Either they fail to ever pick up the check when you go out or when it is their turn to buy a round of drinks, suddenly they are in the bathroom (or have already went home). Worse was a coworker I once had who would look at the check and figure out exactly how much he owed to the penny and put in exactly 15% for the tip. What he always failed to do was consider that his meal was taxed and the rest of us would always have to pick up his shortcomings. I learned to ask for separate checks after a while. So any of you know some Alligator Arms? Are you one? Might do more of these cartoons so any suggestions (try to keep them clean) on other phrases you know or came across on Urban Dictionary? Oh you are that guy for sure!! That’s the 1st time I’ve heard that expression. I must keep it in mind. I know more than one. They never reach for their wallets. Ever. We are not one of those. We are the giving kind that generally always have our wallet open. We don’t hang around with the alligator arms anymore either. Somehow we got rid of them. Yes eventually as fun as they may be, you soon tire of dealing with the check with them and stop inviting them. Not having a lot of friends, I don’t personally know anyone who has alligator or dinosaur arms. I think it’s something that happens when you first meet someone new, there is this unspoken negotiation about how these types of things will be handled. In my group, it was always “I’ll put in $20 because I had an extra drink, so I think $15 from all the rest of you will cover the tax & tips.” The server always made out well because if it looked like the tip was going to be the least bit short, I would slide some extra cash under my plate unobtrusively. I’m not an Alligator Arm guy. But I’m the stinker that calls the party short so that we all make our trains home. No night of partying is worth sleeping in a NYC Train Terminal. I always called them T-Rex friends. Let me buy you a Martini, bearman. Just because I eat all your chocolate and have short arms. . . I know a few of these….. I don’t mind those ones nearly as much as a group of people who sit around arguing over who is going to pay for ten or fifteen minutes. I just don’t have patience for that and end up letting anyone pay the check as long as they just pay the goddamned check so we can leave. I am ashamed to admit that while in my teenage/early 20’s I could be legitimately called “alligator arms”. However nowadays, I am more than willing to pay my fair share (and them some). I do have a friend who is like that, sort of, in that he will pick up the check every once in a great while, but will ask you to pay him back. Sad if you really think about it. A few weeks ago I had a discussion with my wife about the problem of splitting the check/bill. Comparing her and my experiences I concluded that women have a bigger problem with it. However, it could be that most of my experiences were with other engineering types so that might be a bigger factor than gender. Have a bigger problem with people doing it or a bigger problem that they are the offenders? Since I’m busy stalking my kids & their friends on social media these days, I rely heavily on the Urban Dictionary. I’d be lost without it. “Rachet” was my most recent search word. I’ve never heard the word “alligator arms,” but I’ve known a bunch of them. I’m adding it to vocabulary today. Oh great…now I need to look up rachet. BTW you need to fix the URL when you comment. You missed a letter and it goes to an unknown site. Short on arms, short on cash! Great job on the art, Bearman! That only makes you look fatter!!! Go big or go home. Brings his own wine? Is that legal in places where they serve alcohol? Your friend who forgot about the tax, he wasn’t from Germany was he? Tax is already figured into everything. I think us Americans should do that also. It would make calculating purchase price so much easier.